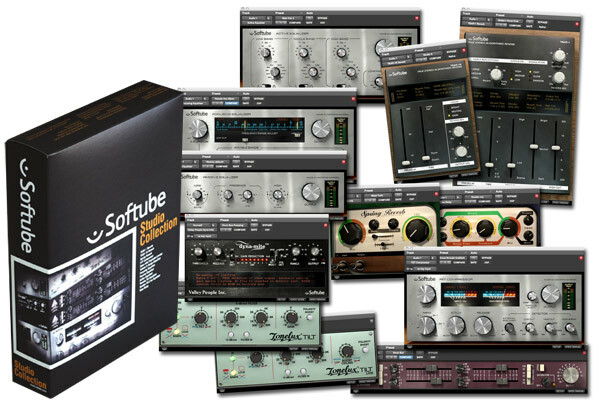 The Softube Studio Collection contains twelve of our award-winning plug-ins - eight emulations of highly-prized studio classics, and four exclusive Softube designs. Now you can equip your studio with virtually the same premier recording, mixing, and mastering tools found in traditional recording studios - and do it for thousands of dollars less. Four Different Reverbs and Delays—Create acoustic spaces ranging from classic spring reverb to lush and vibrant vintage verb to modern, sophisticated ambience. Two Dynamics Processors—Enjoy classic compression with modern features courtesy of the FET Compressor, or turn to the Dyna-mite, the Swiss army knife of dynamics processors from the 80s. Four Equalizers—Choose between an open and wide sound from the 60s, a typical 70s console equalizer, the famous Trident A-Range channel equalizer, or the exclusive hybrid Focusing EQ. Two Specialized Equalizers—Tonelux Tilt and Tilt Live represent 30 years of audio engineering expertise boiled down to a single Tilt knob. And what a knob! TSAR-1 Reverb True Stereo Algorithmic Reverb Model 1. Powerful, sophisticated, detailed, modern-style reverb. TSAR-1R Reverb The world-class TSAR reverb coupled with an easy, fast, intuitive interface. Tube Delay Never before has a digital delay sounded so analog. Trident A-Range Channel 15 from one of the most famous recording desks ever made, complete with original console saturation. Tonelux Tilt and Tilt Live One knob tilt and loudness equalizer featuring extremely low CPU usage. Tonelux Tilt and Tilt Live Live One knob equalizer optimized for live performance applications. Active Equalizer Classic 70s fully-parametric design. Passive Equalizer A wide, clear, and open sound courtesy of a famous design from the 60s. Focusing Equalizer Unique design that combines the Passive and Active equalizers along with a gentle saturation/compression control. Valley People Dyna-mite Limiter, expander, gate, and de-esser in one unit. The classic 80s drum gate, but an even more classic drum squasher! FET Compressor A fresh spin on one of the most famous compressors of all time, updated with parallel compression, detector filters, look-ahead function, and external sidechain.